Ben Friberg is attempting to Standup Paddleboard from Cuba to Key West. Sometime this weekend Ben Friberg, from Chattanoga, and creator of the Chattajack 31 Standup Paddleboard and Kayak Race, will paddle from Cuba to Key West. It’s 90 miles as the crow flies, but paddleboards don’t have wings. Ben will be taking a team that includes his boat captain, cook, navigator, medic, and some additional helpers. Five people are driving from Chattanooga, three are flying, and the rest are down in Key West already. It has taken months and months of wading through red tape and regulations in order to receive the permits to go to Cuba. “I didn’t want to do a lot of publicity before we secured the final permit, in case the trip was a no-go.” In addition to his team (details below), he’s getting help from sponsor Kokatat, a U.S. manufacturer of outdoor water gear located in Arcata, California. The team will take two days to sail from Key West to Cuba. Once on Cuba, they will most likely leave to paddle back to Key West as soon as possible. “Captain Bob doesn’t like to stay on Cuba for too long because he says that the weather can change quickly for the worse and you’ll end up having done all of this preparation for nothing.” The crew is looking forward to any time they are able to spend in Cuba in order to soak up the culture that few Americans get to see. “Captain Bob Olin (Key West, FL) Capt Bob has assisted individuals looking to cross from Cuba to Key West six or more times. He has assisted numerous world-class swimmers (Penny Palfrey, Dian Nyad, Chloe McCardel) and both Cynthia Aguilar’s prone expeditions. Russell Friberg (Chattanooga) Ben’s dad. Russell is one of the happiest go lucky so and so’s in this life. He’s always cracking jokes and trying to get a laugh out of ya. He’s not an endurance athlete but he knows how to laugh and stay positive all day long. Kathy Zerkle (Fayetteville, W.V.) Kathy is our team medic. She has assisted many unique adventures and is in high demand by teams needing a medic. Kimberley Sutton (Wilmington/Wrightsville Beach, N.C.) Kimberley was born and raised in Trinidad and Tobago till age 14, then moved to Manhattan, upon graduating high school she moved to Wilmington/Wrightsville Beach, N.C. She is experienced in endurance endeavors having completed an Ironman, paddled the entire coast of North Carolina (2013), and is no stranger to podium finishes in a multitude of SUP races. David Hughes (Fayetteville, W.V.) David Hughes is a whitewater veteran of 25 years and has chased adventures for the majority of his life. He founded the New River Academy, a high school for kids fortunate enough to travel the world kayaking while completing an accredited high school curriculum. David was Ben’s counselor at the YMCA Camp Ocoee in the early 1990’s. Hunt Jennings (Chattanooga Hunt is the youngest member in our group. Hunt was a student at McCallie High School until his Junior and Senior year, both of which he spent traveling, studying, and kayaking throughout the U.S. and internationally with David Hughes’ high school New River Academy. Hunt is now a top athlete amongst kayaking’s elite and as humble as they come. Sam Silvey and Hugh Huffaker Sam’s and Hugh are both Chattanooga natives. Their element is rock, they climb. Together the two run Silvey+Huffaker Creative. Sam and Hugh will document the adventure as it unfolds. “How long will this take you? Will you get off your board?” I asked. “I hope I can do it in less than 24 hours. I’m mentally preparing myself for 40 hours,” he said. 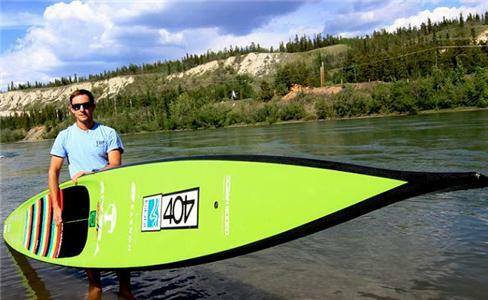 Paddling for 40 hours straight. Why not get off your board and rest? Someday, if travel restrictions to Cuba are lifted, and people who live in Key West can get on a boat, paddle over, and complete the crossing when the Gulf Stream, swell, and wind are all perfectly lined up, he thinks the crossing will be completed in 17 or fewer hours. “I don’t think I will get those conditions,” he said. “After about 12 hours, my stomach has about had it. At that point I eat soft carbs that I can get down. During the 24 hour Yukon paddle last year, what kept me going after hour 12 were kid’s vanilla pudding snacks and blueberries. They’re easy to digest and gave me instant energy. In terms of hydration, he drinks mostly water and takes Hammer electrolyte pills, or might add a supplement to his water pack. “I like the Nuun grape flavor,” he said. Ben said his main fitness goal is “To be able to get up off the couch and do whatever I want.” Most people don’t want to get off the couch and paddle from Cuba, but I see where he’s going with that. Best wishes for fair skies and calm seas, Ben. We’ll talk to you on the other side!